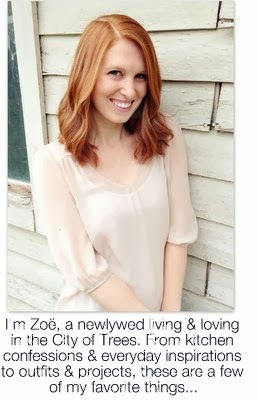 Since I started From A to Zoë in October, I have been so pleased and delighted to watch more of my friends join me on this site and others to share stories, interests, and updates. Some have chosen a specific path of focus, like restaurants, culinary creations, or home decor and other visual aesthetics, while others blog merely as a bridge to friends and family, a sort of online diary or life itinerary. I have friends whose blogs are really their websites, where they post news, ventures, and photographs - tools to identify who they are in a larger sense. I wanted this blog to be an opportunity to unload my thoughts, the things I come across, and the thoughts I have. I'll admit that I try to have a theme, it's where my inner control freak comes out to play, and that I like for it to be a place to rest one's eyes and be comfortable. As more people embrace sites like this one and offer a url that I can visit to learn about the latest in their lives, I am contented. Life moves so quickly and it's important to allow transparency and disclosure to continue, even when our normal modes of communication have been replaced by Google Reader updates. I check the blogs I follow and read about travel, great eating spots, love, new technology, big steps and small victories, and think, oh the places you'll go!